Champagne glassware stretches back to the early 1700's when most drinking vessels were either made of wood or metal. As the centuries rolled by glassware developed and redesigned. Champagne was for many decades drunk out of Coupe glasses- big wide bowls where the bubbles of the Champagne could be seen magically escaping from the bottom of the glass. As our knowledge and technology developed, we realized the shape of the Coupe glass aided the Champagne to go 'flat' with the beautiful fizz disappearing fast; de-carbonization the scientists would call it. 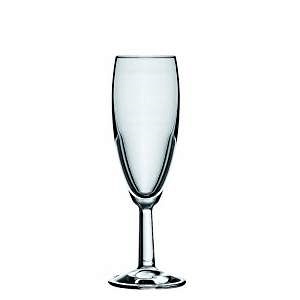 The Champagne Flute - a conical, slender and tall glass was developed in order to keep as many bubbles flowing as possible plus the aroma of the Champagne is channeled in a small area - up and into the drinker's nose.